I’ve been watching a few movies at home just recently. A bit of a mixed bag but amongst them, ‘Carlito’s Way’. (Brian De Palma 1993) I like to think that most people would agree that this is a very fine piece of film making. 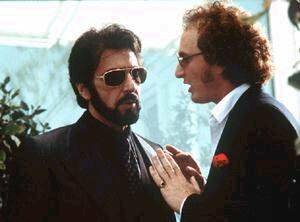 Al Pacino and Sean Penn play the leads, Carlito Brigante and Dave Kleinfeld. The action takes place in New York’s Spanish Harlem during 1975. Brigante has been released from prison after 5 years of a 30 year term because Kleinfeld, his lawyer, has discovered some technical deficiencies in the original case against him. As we are shown the film’s conclusion right at the beginning of the narrative, we are left in no doubt how it will all end for Carlito. There’s much skill required from the director and scriptwriter to tell a story this way and still keep the audience wholly involved throughout the film – which is nearly 2 and a half hours by the way. And the direction and script are brilliant. But there’s more to it than that. What Pacino and Penn bring to the screen is a sense of their characters’ history – their ontological existence if you like. Brigante and Kleinfeld existed before you sat down to watch the movie. What is happening to them now has its origins in the past and the way they have led their lives – the decisions they have made. These actors have to find a way to convey the full extent of that past and how it impacts on the present in order for us, the audience, to agree to the compact with the film’s makers and suspend disbelief while the story unfolds. Pacino and Penn achieve this brilliantly. Their characters are transparent to us. The actors place nothing between themselves and the audience. Nothing is told but all is revealed. There is art but no artifice. So we are in safe hands here. We can allow our critical faculties to take a break and use them later to engage with what we’ve seen and heard. When I see acting of this quality, though, it brings into sharp relief, for me at least, the different types – or styles – of contributions that are made up there on the screen. Not everyone’s an actor. Not everyone can act. And quite often it’s not really necessary that they do. Some perform. And some just do impersonations or impressions of the characters they’ve been asked to play. For instance, I think that Arnold Schwarzenegger is a performer, not an actor. And that’s okay. The films that he makes are vehicles for his particular talents and his on-screen presence. Hard to imagine ‘The Terminator’ being anyone but Arnie, isn’t it? It’s a matter of degree with performing though. Arnie’s right at the top of that list but there are hundreds of performers who tilt their lance at the windmill of acting. Amongst these notables I count Laurence Olivier, who never, in my experience, was able to impart a sense of an inner life to any of his characters. He seemed to me always to be an empty vessel perpetually in character but with no personal stake in the role. The Peter Sellers of tragedians, far exceeded in talent and capability by Gielgud, Richardson and Scofield from that generation. Then there are the impersonators. Those who have a trick bag full of affectations, ticks, twitches, half-smiles and phony accents to gull the movie-going audience into believing the sincerity of their impersonation of a character. Meryl Streep is top of that list. From Lindy Chamberlain to Margaret Thatcher, Streep has cobbled together a battery of mannerisms and expressions that have made her utterly unwatchable for me since ‘Kramer vs Kramer’. John Malkovich and Philip Seymour Hoffman are equally as annoying and tiresome. All of these simply cannot stop acting. Their presence is eternally informed by their duty to acting. If they say one thing to me it is, ‘Look at me, Look at me. I’m an actor. I’m acting now.’ They make me want to reach for something with Gene Hackman or Vanessa Redgrave, Jessica Lange or Brendan Gleeson. Something like ‘Carlito’s Way’. This entry was posted in Film, Opinion. Bookmark the permalink.